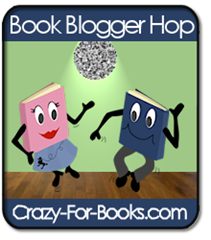 It's Friday, which means it's time for the hop, hosted by Crazy-for-Books! If this is your first visit to my blog, thank you so much for stopping by. I review a huge variety of books, book-related events, and occasionally post my DIY book crafts. Take a look around and let me know what you think! Today's blog hop question is "How many blogs do you follow"? I have 313 on my Google Reader. I do actually read them all, too. There are times when I get way behind, but I try to at least glimpse at each one, even if I don't go to the blog site itself. I'm leaving for vacation this am and I'm so sad that we have to leave her with her grandparents. I hate leaving my baby! Wow! That's a lot of blogs. I have about 160. I like to skim through all the post and then visit the blogs of the posts I really want to read. Thanks for stopping by! I'm now following you. wow you have a lot! Thats great. Just hopping by to say Hi and view your blog! I love book hop friday! I find new ones all the time! Just hopping by to say hi! I honestly have no idea how many blogs I follow. I visit one a day and ten on Sunday. I love to find new blogs and I love to visit the old.